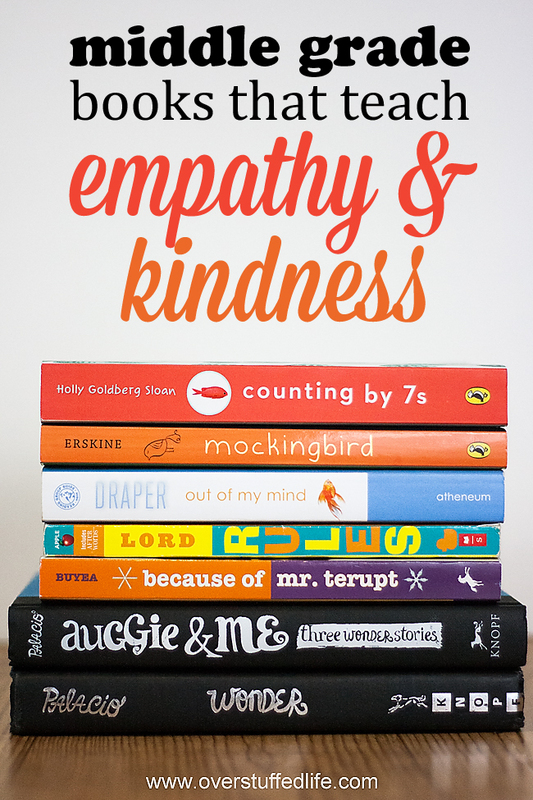 I've been thinking a lot about how to teach kids to be more empathetic and kind lately. After writing a very emotional post about my daughter's experience with bullying, I have found myself wanting to teach my own girls to be more kind to others, despite their differences. Since I think reading books is one of the most fabulous ways to learn anything, I started researching books that have storylines that help awaken empathy in the readers. 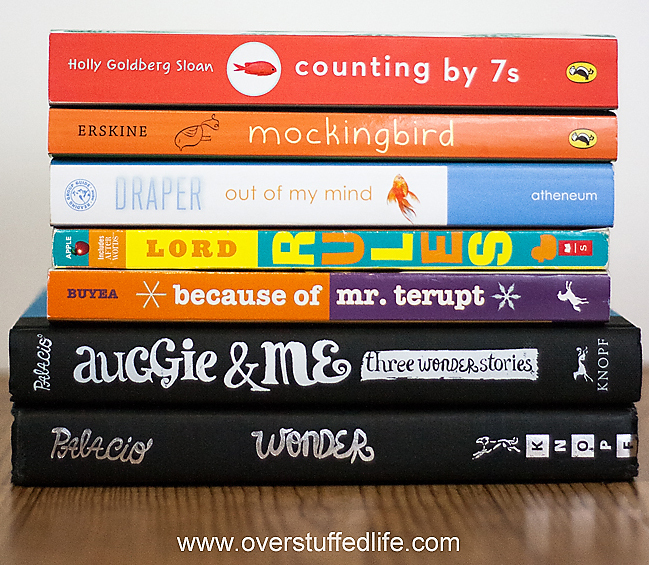 I first thought of the book Wonder by RJ Palacio, which is a huge favorite at our house, but I was able to find several more to put in the pile. This book is about Auggie, a boy who suffers from Treacher Collins Syndrome. This syndrome causes major deformation in his face and after being home schooled for some time, he begins to attend public school. As the story unfolds, he is subjected to both cruelty and kindness by the other kids at school. It's a wonderful read for anyone, but kids will definitely learn empathy for those who look different than they do, and they will also learn that these kids can be really cool and that looks aren't important at all. Buy it here. This is a set of three stories—three different perceptions of Auggie—told by three different characters. We see him from the point of view of the bully, his oldest friend, and the new friend he makes at school. Buy it here. This book very literally teaches children how to have empathy. Caitlin has Asperger's Syndrome and experiences a great tragedy in her family. Her father becomes very withdrawn and depressed, and Caitlin has to learn how to have empathy for him. Through the development of empathy, she and her father are able to heal together. Buy it here. Melody has cerebral palsy and must use a wheelchair. Though she has a brilliant mind, the disabilities she suffers make it impossible for her to communicate. She is finally given a computer to help her communicate and those around her—teachers, students, and even her parents—learn who she really is. It's another really wonderful story about not judging a person by the package they come in and learning to see their soul. Buy it here. Willow is a genius who finds comfort in counting by 7s. She suffers a devastating loss when her parents are killed in an accident and has to learn to navigate the world without them. She is misunderstood by most people, but she ends up with a very happy ending. Buy it here. Catherine is a middle-schooler who desperately wants to be accepted by the cool girl that just moved in next door. She also has an autistic little brother and a good friend named Jason who is confined to a wheelchair and has trouble communicating without his word cards. Her summer is filled with many opportunities to learn what kindness is and what it isn't as she navigates her relationships. Buy it here. Mr. Terupt is the new 5th grade teacher and in his class are the new girl, the bully, the shy kid, the class clown, and several others. He teaches them kindness, empathy, and the desire to improve. Later in the year, a tragic accident lands Mr. Terupt in the hospital and the class is forced to come together and really see beyond their differences and quirks. Buy it here. I know there are several more wonderful books out there, but these are seven that I really liked a lot. Do you have any other great suggestions? I'd love to hear them!